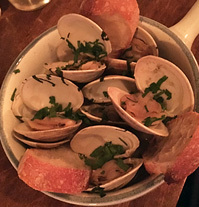 Chamusca is putting the spotlight on fresh seafood at this Lower East Side establishment. The intimate space features exposed brick and wood accents along with table and counter seating. A raw bar in the back of the restaurant showcases fresh oysters from the East and West Coasts, clams and live sea scallops. Other dishes include skillet mussels in a curry coconut broth, count neck clams with lemon, garlic & parsley, and wild head-on shrimp served la plancha. Fish tacos and fried rice bowls with choice of fish are also offered. Craft beers and a nice selection of wines can also be found.